Dimensions (HxWxD): 1.375" x .75" x .75"
This 43.6 carat AAA museum grade starburst shaped specimen of natural Besednice moldavite from the Czech Republic is 1.375 inches long. We obtained this rare specimen many years ago from the collection of author and crystal guru Robert Simmons of Heaven & Earth and it comes complete with a certificate of authenticity from Robert himself. 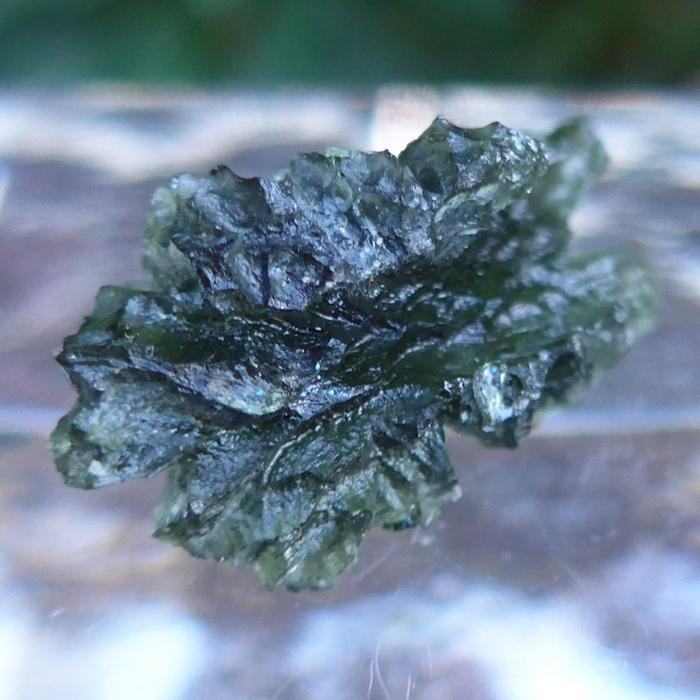 Moldavite is a rare bottle-green translucent stone of unearthly origins, more rare than diamonds, rubies or sapphires. Besednice moldavite is the most rare and desirable variety of moldavite found on the face of the Earth. Besednice Moldavite is instantly recognizable because of its unmistakable dark green coloration and the beautiful lacy splash-patterns it displays, which are often compared to flowers because of their biomorphic form. Besednice Moldavite comes only from a very restricted area, a well-demarcated small location with clay pits at Besednice, Czech Republic. These pits were closed for years in the early 2000s, and although there has been additional production in the vicinity more recently, the more recent moldavites have not had the beautiful coloration or amazing forms that lovers of the original Besdenice have known and come to love. 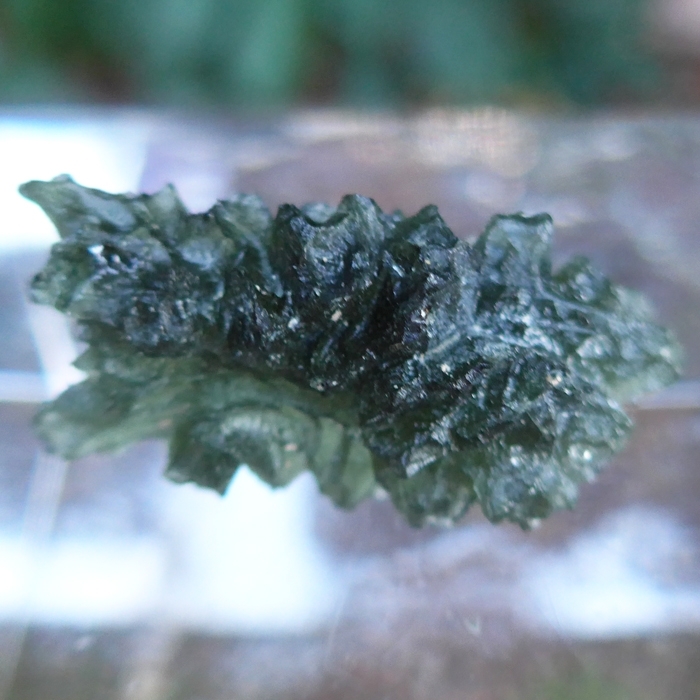 So this is a rare opportunity to obtain the original Besednice Moldavite material, which is both a mineralogical collector's item and a Lightworker's power tool, renowned for its energetic properties by crystal healers and meditators alike. This starburst specimen is fat and displays remarkably detailed and delineated grooves and ridges. It appears so delicate that it is astounding to feel how hard it is. It has the deep green color which is typical of Besednice moldavite and appears translucent when held up to a light source. It is a lacy lovely piece of crystal and is the perfect size to hold in the hand during meditation or for display on an altar or tabletop. From personal experience during meditation with Moldavite, I can tell you that much depends upon intent. 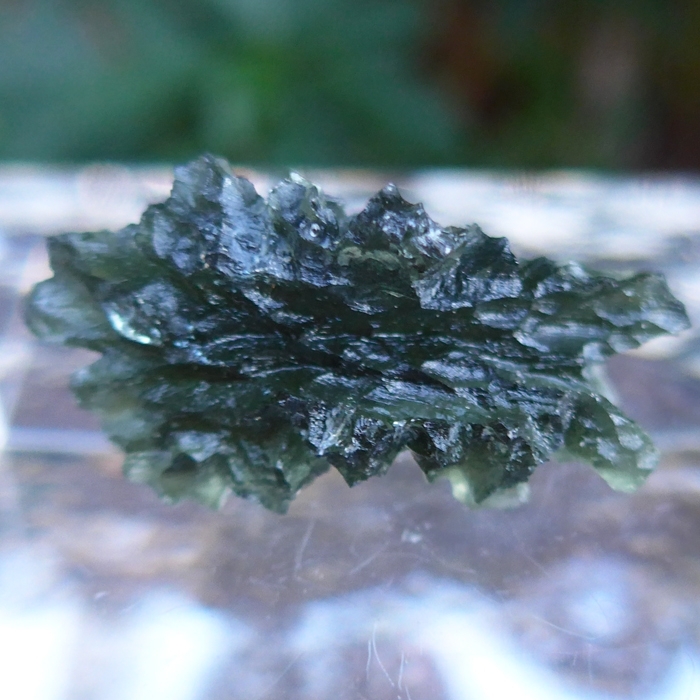 When my intent has been to quiet the mind, holding one of these moldavite stones reduces mental chatter to virtually nothing, while stimulating the crown chakra, the third eye & the eighth chakra above the crown, creating a feeling of warmth & depth, a buzzing and a tingling on the crown of the head and between the eyebrows. There was a physical awareness of a tremendous flows of energy carried on the inbreath and outbreath from the eighth chakra and higher, spiritual sources, through these vital centers and deep into the body. Note: Weight above is shipping weight. Net weight is 8.722 grams or 43.6 carat weight.